Its undercarriage twisted by the impact, a CTA car is upended above Wabash Avenue. Two firemen assist a passenger from one of the exit doors. Impact startled patrons at adjacent restaurants at height of rush hour. BUSINESSES in the area of the elevated train crash at Wabash Avenue and Lake Street were turned into blood-spatterd infirmaries as shop owners and patrons rushed into the street to aid victims. Patrons of the Lakeview Restaurant, 181 N. Wabash Av., watched in horror as "L" cars fell onto the sidewalk. Agnes McCormick, 19, of 6410 N. Long Av., a secretary with the Chicago Public Library, said she was having an early diner and was near the window when the crash occurred. She saw a car tumble from the "L" structure. "My God," I thought, "the car was going to come through the window," she said. She and other patrons hurried outside and found a scene of carnage. "The victims were lying in rows in the street, and some were pinned in the car," Mrs. McCormick said. "Some of them were obviously dead. I saw one blonde girl, about 20, lying in a pool of blood, and there was nothing we could do for her." OTHER VICTIMS were brought into the restaurant, where they were placed on tables, booths, chairs, the floor. Michael Nale, the owner, provided hot water and towels for first aid. Bloody towels were thrown under the counter as new ones were brought in for use as temporary bandages. At the height of the turmoil, more than 50 victims were crowded into the restaurant to receive first aid and the coffee Nale provided. Other victims were taken through the second floor window of the Nathan Burstein Fur Salon, 185 N. Wabash Av, almost adjacent to the tracks. "Firemen used ladders as planks to bring the victims into the salon," Burstein said. "More than two dozen were brought in and put on the cutting-room floor. I looked out the window and saw two firemen administering plasma to a victim in a car parked outside. "I saw [John] Cardinal Cody and other priests administering last rites to victims." ROSCOE JACKSON, an employee of a parking lot on Wabash Avenue, said he was accustomed to hearing the screeching of the trains above him. But he realized there had been a crash when he heard glass shattering. "One guy fell head first out of the window," he said. "Another fell out right next to him, and this lady fell right on top of him." For passengers on the train, the scene was chaos. Bodies were limping across to the aisles. 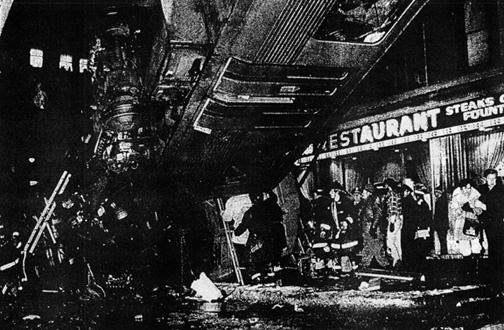 In some cases, victims fell the length of the train as the car plummeted to the ground. "We were standing by the door waiting to get out," said Anthony Robinson, 27, 2470 N. Clark St., a passenger on the northbound Lake-Dan Ryan train. "I guess we were going pretty fast but didn't pay attention. Then we felt a jerking and heard glass smashing. "It was just like King Kong shook the train." He added, "I was lucky I had hold of a pole. Man, I'm just glad the car didn't go off the tracks." For those who were not so fortunate, Fire Commissioner Robert Quinn called an immediate extra alarm to hurry needed man power to the intersection, which was blocked by the wreckage. Police quickly set up barricades to bar curious bystanders and allow rescue equipment to be rushed to the scores of victims on the street.